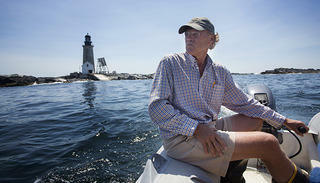 New Englander Saves 1870s-Era "Stag Lighthouse"
Ford Reiche on his way from Halfway Rock Lighthouse. Ten miles off the coast of Portland, Maine, Halfway Rock Lighthouse is so difficult to access that it was deemed a “stag lighthouse” at the peak of its service—for their safety, lightkeepers’ families were strictly forbidden. But its remote Casco Bay location and deterioration after more than 40 years of deferred maintenance did not discourage New Englander Ford Reiche from pursuing his goal of purchasing and restoring the 146-year-old granite beacon. We spoke with Reiche about this project, completed last year, and his lifelong dedication to saving historic places. What was your first impression of the lighthouse and its condition? My wife and I have always lived in old houses and done restoration work on them, so I was not particularly intimidated; it’s big and it was long neglected. My impression was that the government walked away from it in 1975 and did absolutely nothing other than keep the light and the horn going. How have you been using the building? I certainly make it available to the public, but it’s a pretty short list of people who are equipped to get out there. 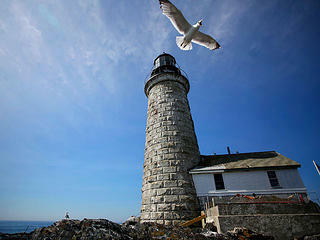 I donate it to charity events that [auction off visits to the lighthouse]. Our family uses it for picnics and to stay overnight. What was the most surprising part of the restoration work? I can frequently anticipate what we’re going to find in a demolition process and, if I can’t anticipate it, I at least know what I’m hoping for. And [this time] I was dead wrong. The living quarters originally had varnished Douglas fir walls with varnished hardwood flooring from 1888. But in the 1960s the Coast Guard ripped apart the two [original] rooms and put in five dinky little rooms—it was just absolutely ridiculous with cheesy 4-by-8 glue-on paneling. I went out there and started doing some demo and I thought that we were going to go right back to the studs. It never, ever occurred to me that everything was completely in place underneath this bad 1960s work. And I was ecstatic. It was one of those moments when you’ve struck buried treasure. The building’s original granite blocks came from quarries in Stonington, Maine. Some might ask, why bother with such a challenging project? That’s kind of the question that, to me, cuts to the heart of preservation. The federal government had offered this for free to any responsible nonprofit. Six expressed interest, and then all of them withdrew as they learned more about the extent of commitment. If this thing had an economic value, someone else would have saved it, and you wouldn’t need a nut like me. If someone could have turned it into a business venture, it would have been saved already. But this is historically important. And it would be tragic not to restore it.